The movement for justice for Laquan MacDonald has unleashed a broad attack on the political establishment in Chicago, implicating “Mayor 1%” Rahm Emanuel and nearly the entire Chicago Democratic Party Machine. Laquan was a seventeen-year-old Black youth whose brutal murder – he was shot sixteen times by Chicago Police in October 2014 – was covered up until after the 2015 Mayoral elections. Thousands have taken to the streets to call for Rahm’s resignation. Mayor Emanuel is trying everything to save his political career, ruthlessly sacrificing other officials like the police superintendent in a desperate effort to contain the damage. A November poll showed 52% of Chicagoans felt Rahm should resign immediately. With the growing threat of a teachers strike, an unending stream of corruption scandals, questions over public pensions and beneath all of this the slow-burning resentment over the longstanding neglect of working-class communities, one of the most powerful public officials in the country is in the fight of his political life. Unseating Rahm Emanuel would represent an important victory for the #BlackLivesMatter movement. 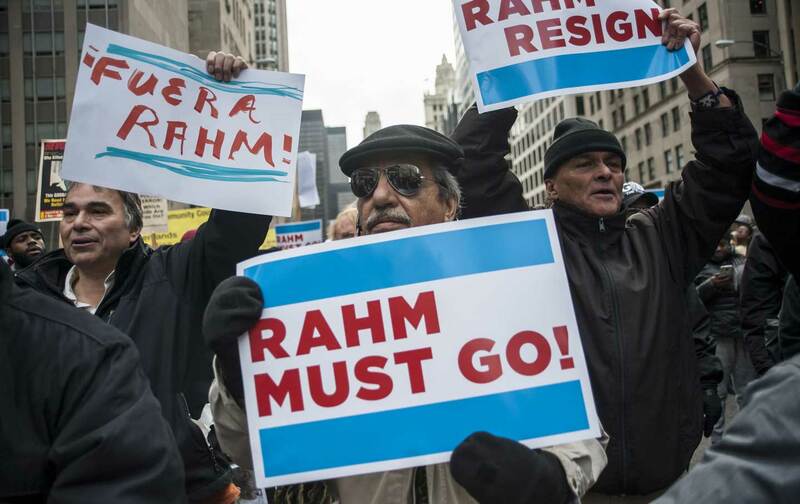 But the #RahmResign movement, taking on the Democratic Party Machine and its deep ties to big business and real-estate developers, raises entirely new questions. For example, who would replace Rahm and the majority of the Aldermen and city officials he controls? How would working class people hold them accountable? Most importantly, how can we build a movement which engages hundreds of thousands of ordinary people to fight a cunning and powerful enemy which will stop at nothing to maintain power? Building a movement requires sacrifices. But working class people, who sacrifice their time and energy every day, require clear goals and a way of reaching them. This means the movement needs democratic structures which can engage wider sections of the working class in the process of winning. Also, there are numerous other communities which are under attack by the same machine which gunned down Laquan McDonald and then covered up his murder. The movement needs to consciously reach out to parents fighting for quality schools, teachers fighting for a decent living, tenants fighting for affordable housing, workers fighting for decent public transportation, and pensioners trying to carve out a decent retirement. These are all potential allies in the struggle. A united movement is not a nice socialist ideal, but a concrete necessity to win. The Democratic Party machine in Chicago understands this, and will act accordingly. It will reach out to conservative black clergy to try to isolate young black activists as being “too radical.” It will appeal to an imaginary “silent majority” of Chicagoans, who are alleged to be content with their condition, and who feel “inconvenienced” by the protests. It will attempt to immobilize the movement by setting up endless committees, inquiries, and investigations. At best, these inquiries amount to the status quo, and therefore, the death of more black youth at the hands of the Chicago Police. This means developing clear demands that speak to the needs of the working class in Chicago, and which cannot be compromised by the Democratic Party machine. On January 6, the Chicago Teachers’ Union’s (CTU) House of Delegates voted to call on Rahm and State’s Attorney Alvarez to resign. Following on its 96% December 14 strike vote, this puts the CTU firmly on the side of the #RahmResign movement and against the corrupt City administration. Now the call needs to be implemented. The CTU, along with allies such as the National Nurses’ Union which is bending every muscle to get out the vote for Bernie Sanders, should join with these growing and diverse movements to begin to build a party of the 99%. Also important is the radicalization around the Bernie Sanders campaign. It is essential to rally his supporters into a growing movement. A rally in Chicago on January 23 brought out thousands downtown to march on the Chicago Board of Trade. This demonstrates that there is a rapidly growing energy to build a political alternative to the two-party corporate system; a party that takes no corporate money and is based in movements and communities, not downtown boardrooms. In Chicago, and in most other major U.S. cities, the Democratic Party has been in power for decades. Reversing neoliberal policies that have destroyed black and working-class communities requires far more than just replacing one wing of the Democratic Party with another. For example, the Mayoral campaign of Chuy Garcia, who was part of the Democratic Party establishment, offered nothing fundamentally different for working people. We will have to build a citywide alternative at the grassroots, involving activists from different movements. The labor unions, especially the CTU, should be stepping in to help organize this movement.